When I completed my tool chest over a year ago I purchased a can of paint which has stayed on the corner of the kitchen counter. 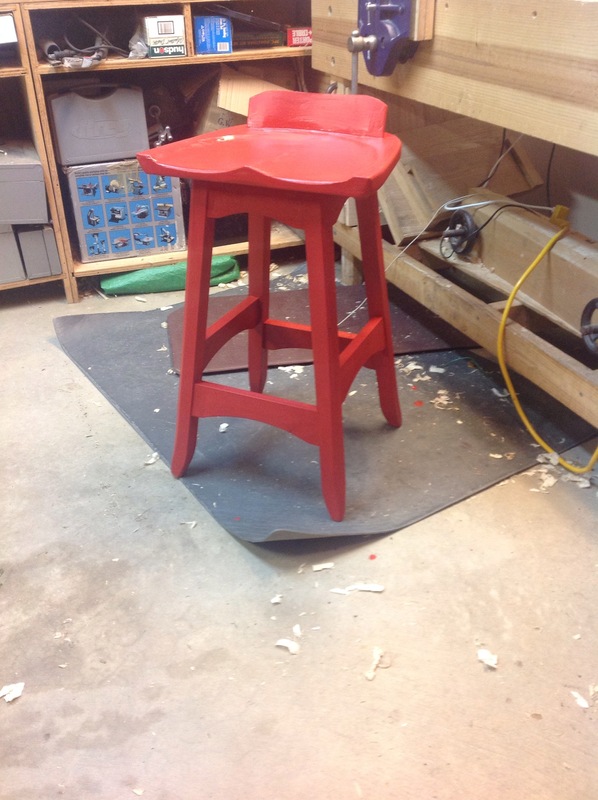 Red chili did not seem to be right for the chest so I submit it here as a possible color for the completed stool. A couple of thoughts as I finish this project. 1. How in the world did it take this long? 2. I don’t really like working in soft woods! 3. It was fun making the tenons and mortises especially with the angles. 4. The stool is really comfortable. 5. One day I will stage a photograph without the clutter. 6. Onwards to the next project! Exceptional work Richard. The color is classy and I can see that your joinery is crisp and spot on. Since its Chili Red, I guess you need to make another one in Chili Green! I see you are already in the Xmas spirit. You must be near the rocking chair class. Look forward to hearing about it. Very nice, I like it! I concur with your thoughts and have them often myself. Bottom line though is anything that keeps us in the shop and off the couch is a good thing. I’m currently working on a project for our wood groups Christmas show that I can’t share because it’s an annoymously judged show. It’s a carving attempt that’s taking forever but ……… I’m intrigued by it even though it may not even work out. Keeping making sawdust and shavings!